Two distinct interbreeding events with Denisovans, a sister group to Neanderthals, contributed to the ancestry of modern East Asians, according to a genetic data analysis. 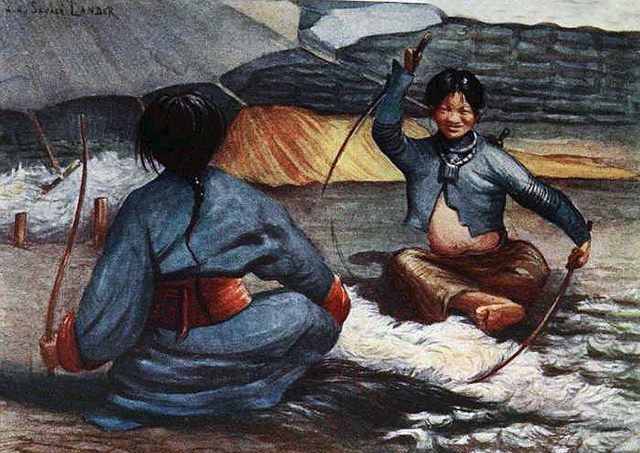 An early 20th century painting of East Asian women combing and washing cotton. Prior to this study, it was known that the genomes of certain populations, such as Papuan individuals, contained about 5% Denisovan ancestry, and that Denisovan ancestry throughout Asia was present to a lesser degree. However, comparison of DNA sequences shows a much closer Denisovan match among Han Chinese, Chinese Dai, and Japanese sequences. Neanderthals and two populations of Denisovans contributed to the ancestry of current-day humans (Sharon Browning and Serena Tucci, 2018). From: Analysis of human sequence data reveals two pulses of archaic Denisovan admixture. Denisovans are a distinct branch of the Homo family tree whose existence came to light in 2010. Analysis of a bone fragment and molars found in Denisova Cave in Siberia revealed a complete genome for a previously unknown human. But other than their DNA, little is known about the Denisovans. No evidence exists that reveals what they looked like, what they ate or what tools and technologies they possessed. Browning, along with the other researchers who worked on the project, applied a new reference-free statistical method call Sprime (pronounced, s-prime) to existing genetic data from the 1000 Genomes project and the Simons Genome Diversity Project. The new Sprime method allowed them to search 5,639 whole genome sequences from present day people in Eurasia and Oceania and identify segments of DNA that were likely inherited from archaic human populations. These genetic variants were compared with Neanderthal and Denisovan sequences. In the future, Browning and her colleagues plan to study additional Asian populations as well as others, including Native Americans and Africans. “We hope to use Sprime to find signatures of introgression from other archaic humans,” said Browning. “We may be able to partially reconstruct the genomes of archaic human populations that did not leave remains with viable DNA for direct sequencing, such as populations that lived in warm and humid regions of the world where DNA decays rapidly." Other co-authors of the paper include Brian Browning, UW professor of medical genetics and adjunct professor of biostatistics; Ying Zhou, UW postdoctoral scholar; Serena Tucci, Princeton University postdoctoral scholar; and Joshua Akey, Princeton University professor of ecology and evolutionary biology and the Lewis-Sigler Institute for Integrative Genomics. Research reported in this publication was supported by the National Institute of General Medical Sciences of the National Institutes of Health under Award Number R01GM110068.